A seven-year-old boy who was at the heart of a public outcry over medicinal cannabis legalisation is doing "amazingly well", his mother has said. 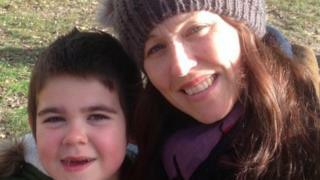 Alfie Dingley, from Kenilworth, was granted a special licence in June to use medicinal cannabis oil. He has a rare form of epilepsy that causes up to 150 seizures a month but his mother, Hannah Deacon, said he has not had any seizures since July. From next week doctors will be able to prescribe medicinal cannabis in the UK. "He's amazingly well," Ms Deacon told the BBC, continuing that "he has not had any seizures" since his cannabis oil was reintroduced. "He's going to school every day, he's riding a horse, he's riding a bike. He has a pretty much normal life," she said. Alfie's family petitioned the government in March after they found his condition improved when he was given a cannabis-based medication in the Netherlands, where it is legal, in September 2017. In July, the home secretary announced plans to allow specialist doctors in the UK to legally prescribe cannabis-derived medicinal products. "In eight months we've moved hugely," Ms Deacon said. Ms Deacon said her son was "coming on amazingly" since he was granted a licence for its use. She said she "cried" through most of Alfie's parents' evening on Wednesday, "because his teachers said he's just doing so well, we can't keep up with him". "It's extremely overwhelming," she said. "When I walk him to school I know how lucky I am." The new legislation means products that meet safety and quality standards are to be made legal for patients with an "exceptional clinical need".